The PCA Stadium, Mohali hosted the 4th ODI between India and Australia. Having won the last game, Australia brought confidence in Mohali and their superb run-chase just proved that. The series is now leveled at two apiece with the final game to be played on Wednesday. Indian openers had been failing to put together a stand of substance thus far in the series. But as Virat Kohli won the toss and opted to bat, a batting paradise was ready for the Indian duo. Shikhar Dhawan, who has been questioned for his poor form of late, was determined to well in Mohali, the venue where it all began for him against the same opposition. He was aggressive from the outset while Rohit Sharma took his time initially. But soon enough, both of them were striking from either end. They added 193 runs for the first wicket before Rohit got out for 95 in the 31st over, But Dhawan carried on to make a century and came back to form in style. The opener finished with 143 from 115 balls in the 38th over. India lost a few quick wickets during the slog overs that hampered their progress slightly. But the quickfire knocks from Rishabh Pant and Vijay Shankar propelled the hosts to 358/9. It was a winning score on most days but there was a threat of dew later in the day. Australia was rocked back early as Bhuvneshwar Kumar castled Aaron Finch for a duck. Jasprit Bumrah did the same to Shaun Marsh and the visitors were struggling at 12/2. But the centurion from the last game – Usman Khawaja was still out there. 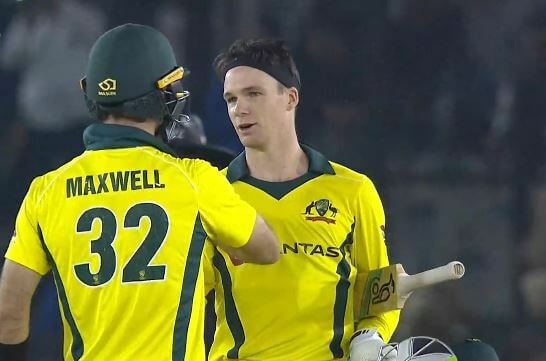 Peter Handscomb gave him good company as the duo scripted a comeback. All of a sudden, the batsmen were dominating and the bowlers weren’t looking threatening. The dew played its part and made it difficult for the spinners to grip the ball. Things were moving swiftly for the visitors until Khawaja was removed by Bumrah for 91 in the 34th over. A magnificent partnership of 192 ended there. Glenn Maxwell came in and threatened to strike big. But Kuldeep Yadav trapped him in front for 23. Handscomb, after getting to his maiden century, departed for 117 courtesy of Yuzvendra Chahal. Australia needed 98 runs from the last 10 balls. However, Ashton Turner, who was playing just his 2nd ODI, was unperturbed. He almost single-handedly took his team close to the victory. Even the death bowling specialist pair of Bhuvneshwar and Bumrah wasn’t tough for him. He kept swinging his bat and ultimately, the Indian bowlers had no answer. With 13 balls in hand, Australia cruised past the line with Turner being unbeaten at 84 from just 43 balls. Australian quicks haven’t bowled a single bouncer to Dhawan. That last six from Bumrah had everyone in splits. Even on an excellent batting surface, 358 is a formidable score. – This is Australia's highest successful run chase in ODIs. – This is the fifth highest successful run chase in ODIs.